Luxury boutique Resort and SPA La Posada de Santa Fe is nestled on six lush, landscaped acres, and features 157 guest rooms and suites. 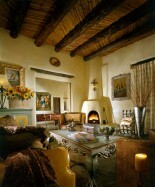 Many of the rooms offer fireplaces and shady patios. In addition to superior amenities, several special suites feature original works of art from some of Santa Fe's most prestigious galleries. For further information on the Rooms and Suites available at La posada please see the side menu. La Posada is located at 330 East Palace Avenue, Santa Fe, NM 87501. The Albuquerque Sunport Airport is approximately 50 minutes from the resort. Santa Fe Municipal Airport has limited commercial service and is located about 20 minutes away. Car and shuttle services can be arranged. For further information on getting to La Posada please consult your ResortWorld representative. Luxury Resort and Spa, La Posada de Santa Fe Resort and Spa, a Rock Resort, is an intimate elegant 5 star property set amid six acres of historically rich land in the heart of down town Santa Fe, New Mexico. Santa Fe, with its pristine air quality, wide open azure skies and sophisticated art scene, has long lured visitors seeking outdoor adventures and cosmopolitan activities. 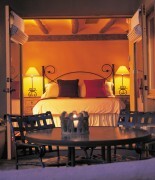 La Posada (Spanish for inn or resting place is a true gem among Santa Fe’s outstanding range of accommodation. Just a short walk from downtown but surrounded by beautiful manicured grounds, La Posada offers her guests privacy and seclusion in a central location. 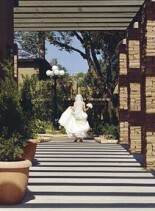 Luxury Resort and Spa La Posada de Santa Fe has 157 rooms which include 4 magnificent suites. The property underwent a 6 million dollar refurbishment in early 2008 and offers guests conference facilities, world class dining, a SPA, swimming pool, outdoor Spa Pool, a whirlpool and much more. The new renovations were undertaken to enhance an already extraordinary resort and to improve its energy efficiency thus keeping with RockResorts comprehensive environmental plan for all of its luxury properties. As part of the interior design plan, La Posada has partnered with the Museum of New Mexico Foundation to incorporate indigenous fabrics and themes. Interior colors are earth toned and the natural shades of the South West with New Mexican inspired accents in wood and weavings. Dining at La Posada is a truly unforgettable experience. The Resort features two restaurants, one of which includes the AAA Four Diamond Award-winning Fuego, where innovative foods are infused with flavors reminiscent of classical traditions, and every dish is carefully presented with superb service. The executive chef focuses on an al a carte menu offering natural and organic ingredients to bring guests the freshest flavors that the southwest has to offer. The more casual Viga is La Posada's newest dining establishment and opens for breakfast, lunch and dinner with outdoor seating available seasonally. 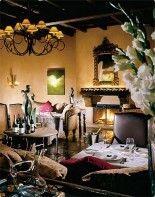 Staab House offers guests a cozy comfortable bar with the new wine room attached. Located in a historic, 19th-century building, Staab House offers guests cocktails, drinks and small plates and tapas throughout the day and evenings. The weekends also bring live music to this inviting establishment. Enjoy a refreshing departure from standard Santa Fe resort hotels at La Posada de Santa Fe Resort & Spa, located just two blocks from the world-renowned Plaza and Canyon Road. This fabulous Resort is within easy walking distance of more than 200 art galleries and close to Bandelier National Monument – where guests can stroll among ancient cliff dwellings, kivas, and petroglyphs. Visit the Georgia O’Keefe Museum and dozens of cultural attractions, including the world-famous Santa Fe Opera. As well as the countless activities outside the resort this magnificent resort will tempt you not to leave. With a world class SPA offering an extensive SPA menu and a state of the art fitness centre, this luxury resort offers guests everything they need for complete rejuvenation. For further information on the SPA menu please see the side menu. During the winter months the ski park is just minutes from La Posada and there is downhill skiing, cross country skiing and snowshoeing available in the ski resort.